Riding the wave of their blockbuster performance at Baltimore Soundstage in February, Rebel Music Collective’s Lo Village performs at the Stay Cool Showcase at SoHo House and Sabu Presents at The Bushwick Public House in NYC. Performing multiple new songs and receiving great reception from the crowd, each event presented an opportunity for the group to firm their footing into two key areas of the New York City music scene and meet their fans outside of the DMV area. Riding the wave of their blockbuster performance at Baltimore Soundstage in February, Lo Village performed at two more events in New York City in March. 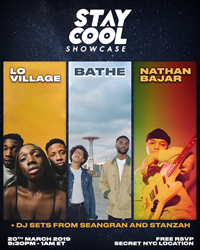 The 'Stay Cool Showcase' at Manhattan's SoHo House and 'Sabu Presents' at Bushwick Public House gave Lo Village listeners a little taste of what is in store for 2019. Performing multiple new songs and receiving great reception from the crowd, each event presented an opportunity for the group to firm their footing into two key areas of the New York City music scene. With more shows up and down the east coast lined up throughout the summer, the group continues to fine tune their live performance and looks forward to collaborating with the talented musicians who have made their previous shows of the highest caliber. Lo Village hails from Gaithersburg, Maryland, a well known breeding ground of hip hop and R&B legends ranging from Logic to Wale. Taking a new approach to modern day hip hop, Lo Village blends neo-soul, old school R&B, go-go, and traditional rap into a striking sound that instills both nostalgia and irresistible head-nodding in every listener. For booking inquiries visit http://www.rebelmusiccollective.com on the Contact Us page.